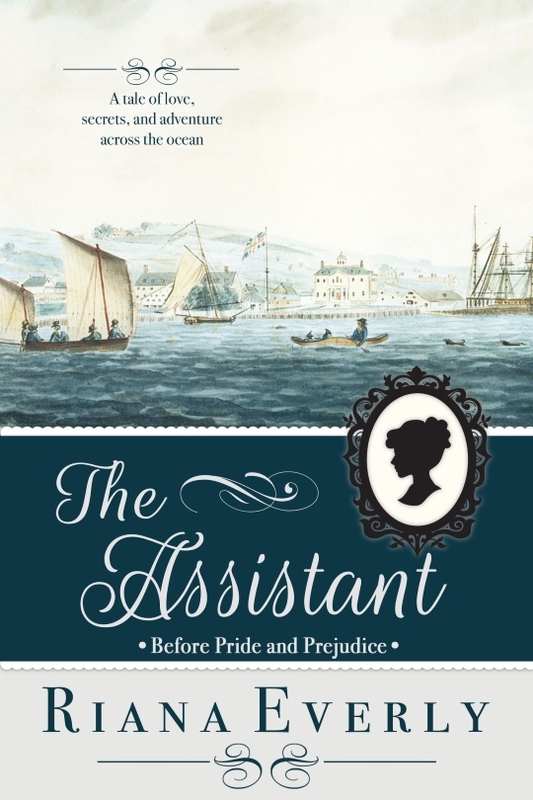 My first post this month is a guest post from Riana Everly who has recently release a Pride and Prejudice prequel called The Assistant, and whom I absolutely love to receive at From Pemberley to Milton. Riana is an incredibly nice person with whom I love to chat, share experiences and talk about cultural differences, but her interesting remarks are not limited to our conversations, they extend to her guest posts and that is one of the reasons why I love having her in my blog. Apart from personalizing each guest post, and adapting it to the blog which is receiving her, she always does her best to bring to my readers interesting and different posts where you can learn something new. Today she explores the Milton connection with a brief survey of some types of textiles used for clothing in the 18th and 19th centuries and I really hope you enjoy this guest post and the excerpt of The Assistant she is sharing today. Thank you, Rita, for hosting me on this stop on my blog tour for The Assistant. In this tale of the romance between Lizzy Bennet’s favourite aunt and uncle, I have imagined Edward Gardiner as the son of a successful merchant who made a reasonable fortune in textiles. Edward, though still fairly young, is starting to take over his father’s business under the old man’s guidance. The Gardiners’ warehouse of exceptional fabric is one of the best places in London for the Ton to outfit their wardrobes for the next season, and there are always new arrivals of woollens, linens, silks and other fine bolts of cloth from across Britain and around the world. What might Edward have in his warehouse, that the upper classes would seek it out so deliberately? In homage to the other part of this lovely blog (the Milton part, where cotton is spun into fine cloth), let’s take a quick peek at some prized textiles from the Regency period. Muslin is a cotton fabric of plain weave, originally from Mosul, Iraq, hence the name. By the end of the 18th century, it was being produced in Britain as well as being imported. It can come in different weights, but for Regency-era clothing, the very fine and delicate sheer weights were the most prized. Muslin takes dye well, and can have designs woven into it, such as dots or window-pane checks. It can be embroidered, and can even be shot through with gold or silver thread, much like can be seen in sari fabric. Muslin tended to be very delicate and frayed easily, and consequently it was mostly worn by the wealthy who could did not wear their clothing roughly and who could afford excellent laundresses and frequent replacement of damaged items. This is Marie Antoinette in a muslin gown, from 1783. In this picture) you can see how sheer the fabric can be. This gorgeous dress is made of muslin made with metallic threads and then embroidered with a delicate design. Silk was used for fine evening dress, and depending on wealth, day dress as well. The silk used for clothing had more body than the very soft silks we see in modern items like scarves, but were still thin and fine, with a soft sheen. Regency-era silk was crisp with good body, and came in a variety of soft colours, ranging from very light to very dark. Modern sari silk is a good approximation of Regency-era silk for clothing. Silk is strong and sturdy for its weight, and wore well. You can see how silk has more body than muslin in this close-up of a sleeve from around 1810. The finest silk for Regency clothing was satin, and white satin was popular for weddings and very fancy events. This is Princess Charlotte’s wedding dress from 1816, made of white silk net with silver. Silk, especially embroidered silk or with a pattern woven in, was also popular for men’s waistcoat fronts. This image is of an embroidered silk waistcoat from France from the early years of the 19th century. England has been producing woollen cloth for centuries. It’s cool and damp climate is ideal for raising sheep, and wool production and trade were a mainstay of the Medieval English economy. Although traditional methods of producing woollen cloth were protected, by the middle of the 19th century, the north of the country was dotted with factories producing this staple textile. Wool, especially superfine and merino was used for men’s coats, which were de rigeur summer and winter. This example post-dates the Regency era by a couple of years, but it shows a well-preserved blue woolen tailcoat. Wool was also used for warmer clothing for both men and women, as well as for outerwear, from spencers to greatcoats. It could be dyed a number of colours, and was comfortable to wear. This gorgeous light purple woollen coat dates from the early 1800s. Women also wore extremely fine and beautifully woven woolen shawls, both for fashion and for warmth. Often imported from India, these Kashmiri—or cashmere—shawls were prized for their beauty and practicality. This fashion plate from 1801 shows a gorgeous red cashmere shawl. That’s a large piece of fabric! I hope this gives a taste of just a few of the fabrics Edward Gardiner and his father might have had in their warehouse, just waiting for the mantua-makers and tailors of the elite to come and turn them into the most fashionable outfits in London. Here is a short excerpt from The Assistant. It looks like Edward has some unusual friends! The morning passed in usual fashion, with customers beginning to return to the shops and establishments to order fine fabrics for new garb, for replacing winter gear, and for redoing worn furniture and draperies. The London Season was in full swing as Parliament sat and the Members’ families sought their entertainment. Edward was summoned to conduct a personal tour of his latest silks for the wife and daughter of a certain marquess, and then, only hours later, to conduct a similar tour for the daughter of an earl, who had heard of the marchioness’ special treatment, and who would accept nothing less. Since both parties purchased great volumes of highly priced silks and damasks, Edward considered this time very well spent indeed! At last, he bid most obsequious au revoirs to the over-dressed Lady Eleanor and informed his manager that he was going home for a while and would return later. Picking up his pace, Edward quickly strode into the family home. There, in the kitchen, enjoying a cup of hot tea and a plate of bread and cheese, sat a grubby man of indeterminate age, clad in rough country clothing. His ragged shirt was of indistinguishable hue— possibly it had once been white—and his labourers’ trousers were torn and filthy. He wore no jacket, although a heavy shapeless coat hung on a hook near the fire. A pair of mud-caked boots sat on some rags by the door. Unshaven and with a balding head of greasy hair, the man looked like the sort with whom an elegant citizen would never deign to converse, let alone entertain in his home. The man smiled, showing a blackened tooth to the world, and when he offered his hand to shake, the nails were caked with grime. Edward looked once, blinked, and then suddenly pulled the man up and caught him in a rough and affectionate embrace. Now who can this odd visitor be? And why is he so poorly dressed? 😉 Read The Assistant to find out. When textile merchant Edward Gardiner rescues an injured youth, he has no notion that this simple act of kindness will change his life. The boy is bright and has a gift for numbers that soon makes him a valued assistant and part of the Gardiners’ business, but he also has secrets and a set of unusual acquaintances. When he introduces Edward to his sparkling and unconventional friend, Miss Grant, Edward finds himself falling in love. But who is this enigmatic woman who so quickly finds her way to Edward’s heart? Do the deep secrets she refuses to reveal have anything to do with the appearance of a sinister stranger, or with the rumours of a missing heir to a northern estate? As danger mounts, Edward must find the answers in order to save the woman who has bewitched him . . . but the answers themselves may destroy all his hopes. Set against the background of Jane Austen’s London, this Pride and Prejudice prequel casts us into the world of Elizabeth Bennet’s beloved Aunt and Uncle Gardiner. Their unlikely tale takes the reader from the woods of Derbyshire, to the ballrooms of London, to the shores of Nova Scotia. With so much at stake, can they find their Happily Ever After? Mr and Mrs G are two of my favorite characters…..will love reading some of their backstory! They are two of my favourites as well. I hope you enjoy this tale. As I began writing, I realized I needed a more concrete picture in my head than just generic fabric. I also sew a bit, and so my interest in fabric is more than academic. The right material can make a piece of clothing. I’m glad you enjoyed this little snippet. Enjoyed your post as I love the fashion during this time. Loved the excerpt, and I am intrigued by who the man may be that elicited such a response from Edward. Our hero has some interesting friends! I’ll leave it at that. Oh, I love a post about textiles and fashion any time! Never mind one that has an excerpt with a surprise teaser! Thanks to Riana for the post and Obrigada to Rita for hosting! I don’t need to be in the contest as I already have the book and am about to start reading it so these teasers won’t tease me anymore! Hahaha! Once you get started, I certainly hope you enjoy it! It’s a perfect day for this post, since I just got home from the fabric store myself. There were no surprise visitors awaiting me when I returned, however. OMG! What a delightful post. Thanks Rita for hosting. Thanks to the author and the publisher for the give-a way. I have always loved Uncle and Aunt Gardiner. I am always delighted with a Gardiner story as there aren’t many of them. It is always fun to see the different versions of how this wonderful couple met. They had such an influence on Jane and Elizabeth that they have a firm hold on the JAFF community. Thank you for writing this and sharing this excerpt with us. I loved it. Blessings on the success of this work. So glad you enjoyed this. It really was fun not just to explore the textiles themselves, but to see what sort of clothing each type of fabric was best for. And yes, there is something so appealing about the Gardiners, the relatives “for whom she need not blush.”They were wonderful to write about, but not completely without their quirks! Thanks so much for the chance to win a copy of your book. Congrats!!! I can’t wait to read it. Mr. & Mrs. G are 2 of my favorite characters. They were so much fun to write. Good luck! Isn’t the coat lovely? And that waistcoat? Some of the embroidered waistcoats were just stunning. It was hard to choose just one. I know I’m going to love this book when I get to read it. Loved this excerpt. The information you shared about fabrics truly sings to my fabriholic heart. I don’t sew like I used to for a number of age-related reasons, but my love for it hasn’t faded and the history of fabric fascinates me like nothing else. I’ve imagined the Gardiner warehouse countless times in my reading of JAFF, and have imagined a story or two myself. My goodness Riana, thank you! Oh no, NOT silly at all, Riana. I have been there and done that so many times it’s not even funny. Wow, I wish I could see your fabric store. When my son lived in Houston I found out about some amazing fabric stores where you could’ve literally spend days there and not lose interest. We’ve moved across country alas, but like I said above, I don’t sew like I used to. Still, I have those very special pieces I’ve never been willing to do anything with yet. I guess it does sound silly when you really talk about it, at least at my age!!! Thanks Darlin’ this has been a fun subject to share with you. I loved the excerpt. Looking forward to reading the entire book! Thanks! Hope you enjoy the story. Who was the man that Edward warmly greeted? I want to know! I enjoyed reading about the various materials and having clarity on them. The fabrics were beyond beautiful as were the designs and handwork. Thank you for sharing and thank you for the giveaway. This unexpected guest turned into one of my favourite characters. I’m glad you enjoyed the post. I also like a visual reference for things. Can you imagine working with that muslin, though? It’s so fine! Good luck on the draw for the giveaway. I’ve been enjoying all of your informative blog posts, Riana! So educational! I really liked this one with the beautiful photos. And the mysterious man in the kitchen is quite intriguing. I wonder who he is. I have always thought that Mr. and Mrs. Gardner had a great deal to do with Jane’s and Elizabeth’s manners being so much more refined than their sisters. So this story does intrigue me. I would like to read about this stranger and why he is embraced. The Gardiners really are a special couple, and I also think their influence has a lot to do with why Lizzy and Jane are so much more refined than the younger sisters. I hope you enjoy the tale I’ve woven about them! What an interesting premise! This book will definitely find it’s way to my library, one way or another! I loved all the information on regency clothing/cloth. Thank you! I’m glad you enjoyed the post. I certainly had fun putting it together. I hope you also enjoy the book. My pleasure! I’m not nearly the fashionista that my daughter is, but clothing says so much about culture and status, and reflects on who could do what! It’s a fascinating area to research. Thank you for sharing this informative post on fabrics used, Riana. And accompanying it with some beautiful pictures to accentuate your point. The excerpt you selected is good too. Is it by any chance Sherrington? For those who don’t know who he is, you can read a vignette about him on my blog. Your individual commitment to getting the concept through had become alternatively potent and also have consistently made it possible for personnel exactly like everyone to reach from the desired goals.